Self-cleaning fabrics made from wool and silk have been achieved, in the laboratory, using nanoparticle coatings. In tests, coated fabrics were greatly resistant to common stains. 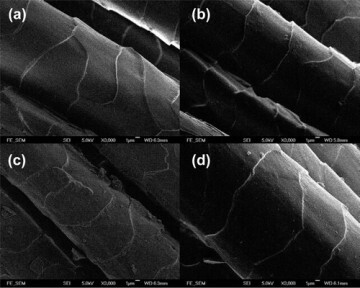 FESEM (Field Emission Scanning Electron Microscopy) images of (a) pristine wool fiber, (b) modified wool fiber, (c) T60-coated wool fiber, (d) T60-coated modified wool fiber. The nanoparticle coating was more effective than plain wool as well as wool coated with a conventional stain-fighting coating. "wool treated with a new nanoparticle coating (bottom row) removed red wine stains more effectively than plain wool (top row) and wool coated with another stain-fighting chemical (middle row), scientists say. 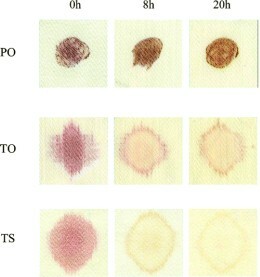 (Credit: Monash University and American Chemical Society) It shows "the degradation of red wine stains on pristine PO, T60-coated TO, and T60-coated modified TS samples after 0, 8, and 20 h of light irradiation by a solar light simulator." This study shows that self-cleaning fibrous proteins such as wool can be produced by a simple coating process with anatase TiO2 under mild conditions. A modification of these fibrous proteins with succinic anhydride introduces additional carboxylic groups by acylation which allows for enhanced bonding between TiO2 and the fibers that in turn results in more effective self-cleaning properties. The chemical modi- fication and anatase coating processes do not employ toxic reagents or solvents and the procedures are carried out under mild conditions favorable for keratinous materials. If you're into the subject, take a look at Self-Cleaning Sportswear and Polymer Film Sprinkled With Silver Nanoparticles. From Self-Cleaning Fabrics via Roland.